It's National Smile Month guys (15th May-15th June), time to get your smile on and flash those gnashers! 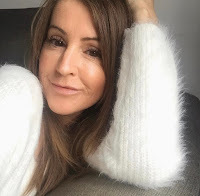 I don't know about you but I'm always looking for ways to improve my smile, I want to get my teeth straightened a bit with some braces but that's another issue so, for now I'm looking at ways to whiten my teeth and make my smile that little bit brighter. I've done oil pulling in the past to help whiten my teeth (you can read about that here) and it does actually work for me although I've become a bit slack on that and I'm very disappointed in myself, sooo, when the lovely folk at Janina got in touch to see if I wanted to try some products I jumped at the chance. 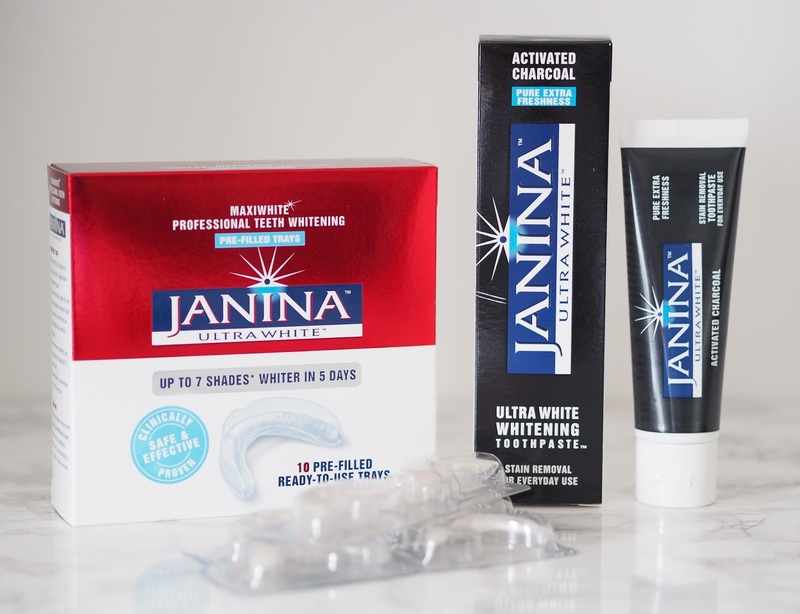 Janina offer a good range of products, different types of toothpaste, whitening strips and pre filled whitening trays. If you're wondering what National Smile Month is, in a nutshell it's a campaign to promote good oral hygiene with events and activities up and down the UK to help motivate and educate, and Janina wholeheartedly support the campaign. Let's talk about the Activated Charcoal toothpaste*. "Charcoal"? " What the hell"! I hear you cry. I thought the same as you to be fair and thought no way on this earth would I be able to brush with it. Fear not though, it's not in any way bad. It's a bit weird, it's grey, and looks a bit off putting but you'll be fine with it. It has the texture of any regular toothpaste and is extremely minty, powerfully minty, and I like that, my mouth feels really clean and extremely fresh after I've used it. The instructions on the box tell you not to rinse with water after brushing, so it lets the active ingredients continue to do their thing, but personally I have to rinse!! It's a whitening toothpaste with a low abrasion formula that removes stains without damaging the enamel. The formula contains a patented Bromaine complex, which is a combination of natural enzymes from pineapple and papaya, which help to whiten teeth without the use of harsh abrasives, and that's great news as we all want our teeth to look white but we need to protect them too. The activated charcoal has the ability to absorb toxins from the mouth and is great for lifting stains, providing good oral hygiene and keeping breath fresher for longer. I was really excited to try the Maxiwhite teeth whitening trays*. As you can see the system comes with 10 pre filled trays allowing you to easily whiten your teeth at home with no abrasives or harsh chemicals. The trays are basically a 'one size fits all', designed to help whiten the front and back of your teeth. They're soft and flexible and you pop them on and leave them in place for 35 minutes, not sure why it's 35 minutes and not 30, but anyway, that's what you do. I put mine on just before bed but I guess you could do it at any time. The active ingredient is sodium percarbonate and when this comes into contact with saliva it forms a whitening action. The gel has a mild minty flavour so there's no unpleasant taste. When your time's up discard the trays and rinse with water. If you decide to try these, don't follow the fitting instructions on the box like I did. For some reason it tells you to fit the top tray first, then the bottom. NOW, when I did this, the top tray just dropped off my teeth as I was opening my mouth trying to get the bottom one on and all the gel went all over the place and I got in a bit of mess. Fit the bottom first, makes sense right?! So, these little trays claim to whiten your teeth by 3.6 shades after 1 application, and after 5 days possibly up to 7 shades whiter. Results for me? Well, I've seen a difference, not an "oh my God, that's amazing" kind of difference, but my teeth are definitely whiter without a doubt. Here's the thing though, my teeth are fairly white already, not brilliantly white but they're not particularly yellow or incredibly stained, so I think that's why I've not seen the biggest change. Your teeth however are different to mine, may not be as white to start off with and you may therefore get some great results from this system. If you've got yellowing or stained teeth then it's definitely worth giving it a go and would be great if you've got a special occasion or something coming up because that's when I'll be using it again! A note to finish on. I have sensitive teeth so was a little wary of trying this, as these sorts of products can sometimes make them worse but it hasn't been too bad, they've been a little more sensitive than usual but nothing I can't cope with and it wouldn't stop me using them again. If you've got super sensitive teeth this might not be for you. If you want more info on the whole Janina range you can find it here or pop into your local Boots to pick some up and if you want more info on National Smile Month you'll find all you need right here. Have you tried anything from the Janina range before? *products were sent for review but all opinions are my own. Ooo interesting! I've tried whitening products before and they made my teeth really sensitive, but will keep an eye out for these! I've just started the process for braces! Eek! Had the x-rays and molds done and have another appointment in the week for measuring! 18 months I'll have them in!! OMG! haha..